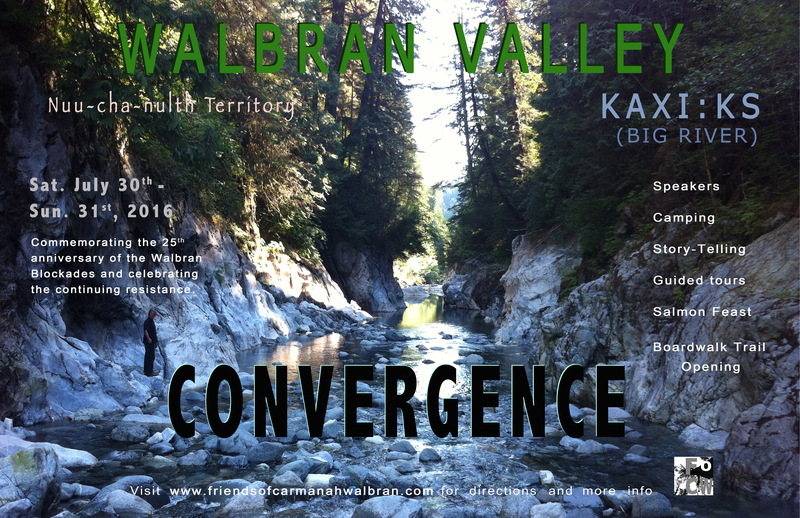 Join us for the 2nd annual Walbran/Kaxi:ks Convergence. July 2016 marks the 25th anniversary of the Walbran Valley Road Stops Here Campaign, a successful series of non-violent direct action(s): tree-sits, road barricades, office sit-ins, hunger strikes, banner hangings and public protests that were pivotal in the creation of the 13,000 ha Carmanah/Walbran Provincial Park. A quarter of a century later, three generations of concerned citizens join together to altogether halt the needless destruction of the world-class ancient temperate rainforest in the heart of the watershed, in the beautiful Central Walbran Valley/ Pacheedaht/Qwa-ba-diwa territory that was foolishly left out of the park in 1994, and is still, after all the backlash, slated for logging by Surrey-based Teal Jones, who has been clearcut logging the steep side hills to the height of land, along park boundaries, on the south side of Walbran river. Enough is enough! This festive gathering will include the very exciting and historical grand opening of the first official leg of The Harriet Nahanee Memorial Trail. Harriet Nahanee, originally from Pacheedaht and present in the Walbran Valley on the front lines in the 90’s, was a lifelong activist involved in many struggles fighting for the recognition of Indigenous land rights and protection of the environment. She was a human rights activist and fought against discrimination, marginalization and institutionalization of Indigenous people in the cities, especially Indigenous women in Vancouver’s Downtown Eastside. She was a vital member of many movements and activist communities, and a strong role model for many including some members of FoCW. The gathering will also include speakers, hikes, workshops and community meals. Join the past with the future, in our common cause to end old-growth logging, once and for all, in the Walbran Valley. All are welcomed for this weekend of camping, celebration of place and all the good work being done by so many at this mass Convergence in the most beautiful time of the year, in one of the sweetest places on the island, the best of the last, the last of the best, of the great ancient Red Cedar Forest. The Friends of Carmanah Walbran are organizing transportation to the valley for a Saturday day trip and also for an overnight camping trip. We are organizing festive community meals and other activities suitable for a range of ages. Details are below. 7:30am Vans leave Victoria City Hall, travel via Duncan and Lake Cowichan. – Procession to trail head. Solemnly acknowledging on-going ecological destruction of the watershed and urgent need for an old-growth logging moratorium. – Grand Opening of the newly upgraded boardwalk trail which will now be known as The Harriet Nahanee Memorial Trail. Dedication speeches and acknowledgements. Performance with recording artist and eco-troubador Luke Wallace. Night hike to lower falls for ‘Luminous Forest Project’, after dark. -Karst geology and old-growth forest ecology. -Trail-building as a campaign strategy. -Community-based Economic Alternatives to Old-Growth Logging. We are also no longer taking vacations for the community meals. Although we will have quite a few extra plates available please arrive in the valley with enough food to get you through. Looking forward to a fantastic weekend! A limited number of seats in passenger vans for transportation to and from the Walbran Valley can be reserved via picatic (https://www.picatic.com/event14673937418038305) or by emailing us directly (friendsofcarmanahwalbran@gmail.com). These are available for a Saturday day trip OR an overnight trip. Rides will leave Victoria City Hall Saturday morning at 7:30am sharp. Vans will return either late Saturday night (leaving the valley at 8/8:30pm, back approx 11:30/12) or Sunday evening (leaving the valley at 5pm, back approx. 8:30pm). Round trip tickets are being offered at a subsidized rate of $60 each or at the full cost of $80. If you would like to attend but are not able to contribute towards the cost of transportation please contact us directly via email. if you are driving and can offer rides, please let us know and we will help coordinate rides with riders. If you are looking for a ride please let us know and we will help! There are limited kitchen facilities in the valley. For all other meal requirements (and if you do not reserve plates in the community meals) please come prepared and self sufficient. – Traditional pancakes with the option of added rainforest wildberries provided by you!